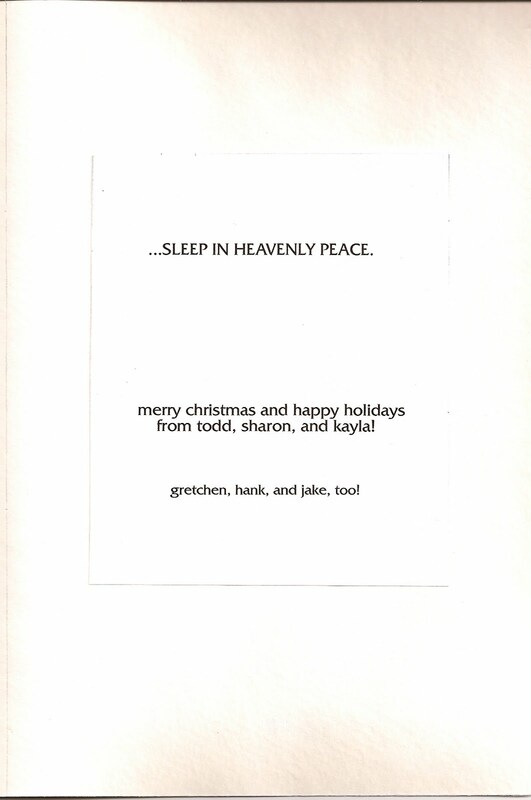 perhapablog... and other ramblings: christmas card 2010~! 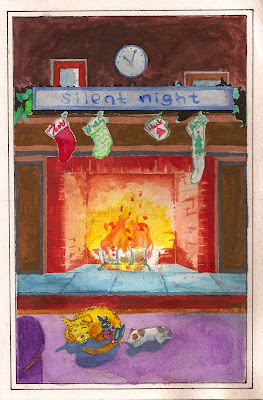 for me, doing the card means that i need to immerse myself once again into that wacky watercolor world that i created for gretchen, hank, and jake to have their holiday fun and, even though it's been 8 months, i didn't think i was going to be able to come up with anything funny. for weeks i agonized over what to do, but it just wasn't happening. 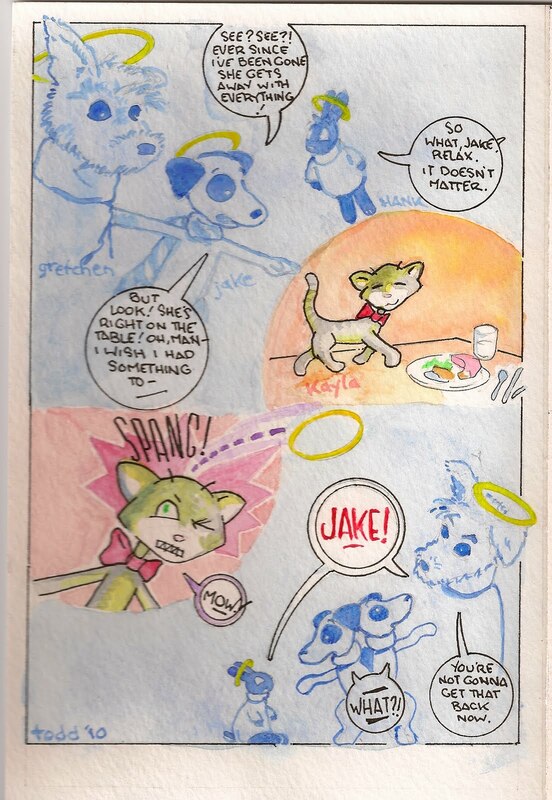 i've continued to hear jake's 'voice' in my head these past months, but not anything very funny. 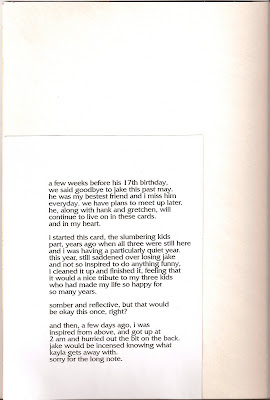 i wanted he card to be the light, slightly humorous silliness that it had been in years past, but it just wasn't coming. my heart heavy, i resigned myself to going with the somber 'silent night' piece i'd started years ago. then, when it was finished and i'd gotten that out of my system, purged the emotional gravitas, as it were, inspiration struck. 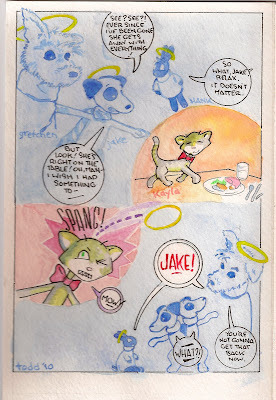 i asked God for some help, for something humorous that i couldn't see--but it was jake's voice that said, "that cat's getting away with murder." so here's my card for 2010! stop back friday--christmas eve! !--for some more scared of santa, some fun holiday pictures, and the awesome sketch that lauren monardo included inside her christmas card that made me and sharon laugh out loud! and some christmas trivia? should we do some trivia...? We got ours last night Todd and it really did bring a tear to our eyes. Just a lovely, lovely card. Thank you. Really wonderful. 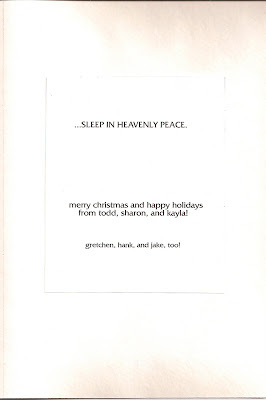 It's one of my long-term goals to get on your Christmas card list, my friend. Merry Christmas! Russ - that's one of my long term goals too!! 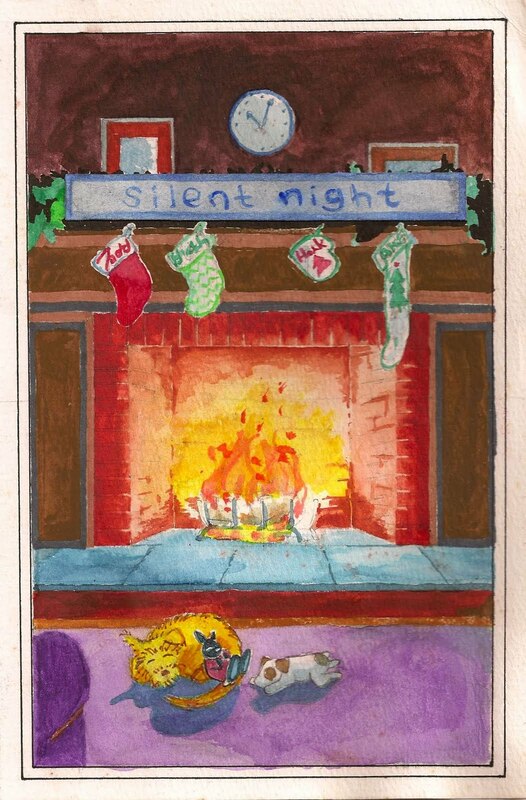 Dear Todd - what a beautiful card - You are quite talented (with the water colours and with bringing out such feelings in your cards). Merry Christmas/Happy Holidays one and all! hey i just sent you an 'e' about the card and how nice it was, but i did forget to add that the piece you finished it with on the back was great. It just wouldn't be Christmas without a "visit" from the kids. That's beautiful Todd. Funny and beautiful. Thanks for sharing. 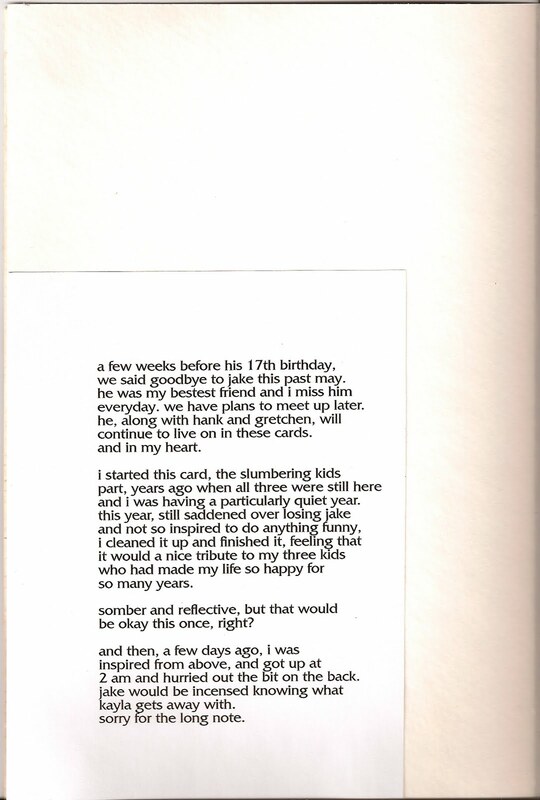 That was the perfect card Todd. Merry Christmas to you, and everyone on here!